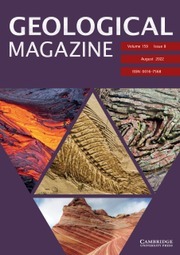 Geological Magazine, established in 1864, is one of the oldest and best-known periodicals in the Earth Sciences. Its worldwide circulation, broad scope and high production values keep the journal at the forefront of the field. It publishes original papers, review articles, rapid communications and discussions about all aspects of the geosciences. It covers a wide range of sub-disciplines in the solid earth geosciences both on and offshore, with emphasis on observational geology, mineralogy and palaeontology. In doing so it provides a niche for interdisciplinary papers on regional geology that can inform our understanding of global geological processes, as well as more wide ranging studies on the fundamental principles of the Earth Sciences.